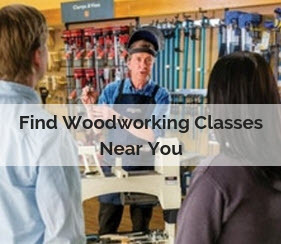 Making smooth, safe cuts with your table saw, radial-arm saw, chop saw or sliding compound miter saw depends on having the right blade for the tool and for the type of cut you want to make. There's no shortage of quality options, and the sheer volume of available blades could bewilder even an experienced woodworker. That's why we've put together this article. It's part glossary and part guide, with important basic information to help you make the right selection saw blade selection for your project. 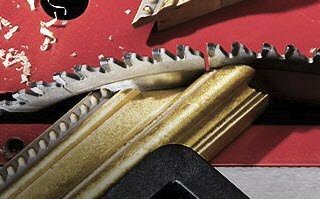 How Do I Choose The Right Saw Blade? In what type of saw will the blade be used? 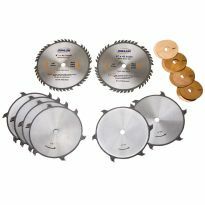 Some blades are designed to be used in particular saws, so you'll want to be sure to get the right blade for the tool. Using the wrong type of blade for the saw is likely to produce poor results and might in some cases be dangerous. What materials will the blade be used to cut? If you need to cut a wide range of materials, that will affect your choice. If you cut a lot of a single type of material (melamine, for example) that specialization also might affect your choice. What types of cuts will the blade be used to make? 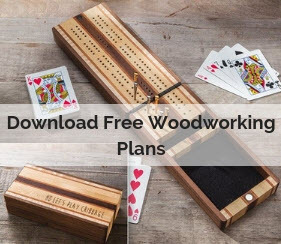 Will it be used exclusively for crosscutting (cutting across the woodgrain)? Will it be used only for ripping (cutting with the grain)? Will it need to produce good results in all types of cuts? Do you want to build a collection of specialized blades, or do you want one blade that can make all kinds of cuts? Are you willing to change the blade every time you switch from one cut to another? How powerful is the saw on which the blade will be used, and what size blade does the manufacturer recommend? 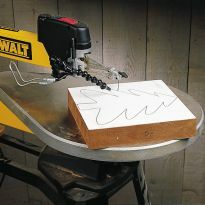 Is it a 3 hp cabinet table saw or a portable job-site saw? Is it a 10" saw or 12"? Answering these questions will go a long way toward clarifying your best options. 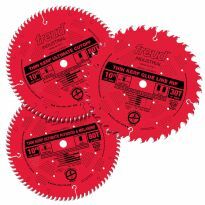 Understanding a little about the anatomy of a saw blade can help further narrow your search.Saw Blade Essentials Many saw blades are designed to provide their best results in a particular cutting operation. You can get specialized blades for ripping lumber, crosscutting lumber, cutting veneered plywood and panels, cutting laminates and plastics, cutting melamine and cutting non-ferrous metals. Many saw blades are designed to provide their best results in a particular cutting operation. You can get specialized blades for ripping lumber, crosscutting lumber, cutting veneered plywood and panels, cutting laminates and plastics, cutting melamine and cutting non-ferrous metals. There also are general purpose and combination blades, which are designed to work well in two or more types of cuts. (Combination blades are designed to crosscut and rip. General-purpose blades are designed to make all types of cuts, including in plywood, laminated wood and melamine.) 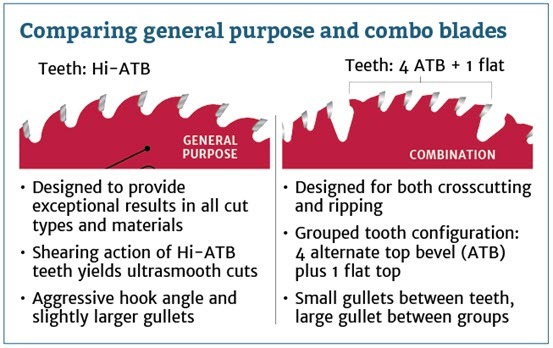 What a blade does best is determined, in part, by the number of teeth, the size of gullet, the tooth configuration and the hook angle (angle of the tooth). 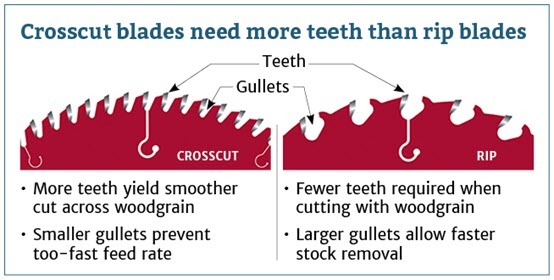 In general, blades with more teeth yield a smoother cut, and blades with fewer teeth remove material faster. A 10" blade designed for ripping lumber, for example, usually has as few as 24 teeth and is designed to quickly remove material along the length of the grain. A rip blade isn't designed to yield a mirror-smooth cut, but a good rip blade will move through hardwood with little effort and leave a clean cut with minimal scoring. A crosscut blade, on the other hand, is designed to produce a smooth cut across the grain of the wood, without splintering or tearing. This type of blade will usually have 60 to 80 teeth, and the higher tooth count means that each tooth has to remove less material. 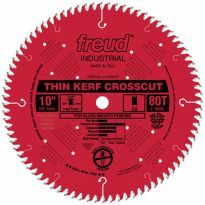 A crosscut blade makes many more individual cuts as it moves through the stock than a ripping blade and, as a result, requires a slower feed rate. 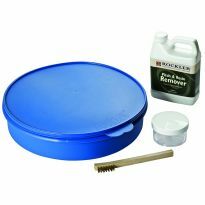 The result is a cleaner cut on edges and a smoother cut surface. With a top-quality crosscut blade, the cut surface will appear polished. The gullet is the space in front of each tooth to allow for chip removal. In a ripping operation, the feed rate is faster and the chip size is bigger, so the gullet needs to be deep enough for the large amount of material it has to handle. In a crosscutting blade, the chips are smaller and fewer per tooth, so the gullet is much smaller. The gullets on some crosscutting blades also are purposely sized small to inhibit a too-fast feed rate, which can be a problem especially on radial-arm and sliding miter saws.The gullets of a combination blade are designed to handle both ripping and crosscutting. The large gullets between the groups of teeth help clear out the larger amounts of material generated in ripping. The smaller gullets between the grouped teeth inhibit a too-fast feed rate in crosscutting. The shape of the saw blade tooth and the way the teeth are grouped also affect the way the blade cuts. The configuration of the teeth on a saw blade has a lot to do with whether the blade will work best for ripping, crosscutting or laminates. Flat-top teeth are used on blades for ripping hard and soft woods. Because wood is much less likely to chip and splinter when it is being cut with the grain, a rip blade is designed to quickly and efficiently remove material. The flat-top tooth is the most efficient design for cutting and raking material out of the cut. This means that the blade teeth alternate between a right- and left-hand bevel. This configuration yields a smoother cut when crosscutting natural woods and veneered plywood. The alternating beveled teeth form a knife-like edge on either side of the blade and make a cleaner cut than flat-top teeth. Combination blades are designed to do both crosscutting and ripping. The teeth are arranged in groups of five – four ATB teeth and one FT – with a large gullet between the groups. The TCG configuration excels at cutting hard materials such as laminates, MDF and plastics. Teeth alternate between a flat "raking" tooth and a higher "trapeze" tooth. The TCG configuration is also used for non-ferrous metal cutting blades. The Hi-ATB configuration is used for extra-fine crosscutting and to cut materials surfaced with melamine, which is prone to chipping. The high bevel angle increases the knife-like action at the edge of the blade. Hook angle has an important effect on blade operation. A blade with high positive hook angle (say, 20°) will yield a very aggressive cut and a fast feed rate. A low or negative hook angle will slow the feed rate and will also inhibit the blade's tendency to "climb" the material being cut. A blade for ripping lumber on a table saw will generally have a high hook angle, where an aggressive, fast cut is usually what you want. Radial-arm saws and sliding compound miter saws, on the other hand, require a blade with a very low or negative hook angle to inhibit overly fast feed rate, binding and the blade's tendency to "climb" the material. The width of the "kerf" – the slot the blade cuts in the material – is another important consideration. Many blade types are available in both full-kerf and thin-kerf varieties. Full-kerf blades typically cut a 1/8" slot and are intended for use on saws powered by 3 hp (or greater) motors. Potential trade-off for the thinner kerf is the fact that the blade plate is thinner and therefore might be expected to vibrate more than a thicker, more rigid plate. However, technological advances in blade design have generated thin-kerf blades that rival the best industrial-quality full-kerf saw blades. Vibration-dampening systems, like the one used with Freud thin-kerf blades, compensate for the slight loss of stability and make thin-kerf blades the optimum choice for lower-powered saws. The teeth on most high-quality saw blades are thick carbide tips that have been fused (or brazed) to the steel blade plate. How long the blade will stay sharp, how cleanly it will cut and how many re-sharpenings it will take all depend on the quality of the cutting tips. On some of the best blades, the carbide is formulated specifically for the application of the blade, and a tri-metal brazing process is used to attach the carbide cutters to the blade plate. This process, in which a layer of copper alloy is sandwiched between layers of silver alloy, provides extra flexibility and impact resistance. At a minimum, look for a blade with C3 grade micro-grain carbide teeth, which are thick enough to allow a number of re-sharpenings. So which blade is right for you? 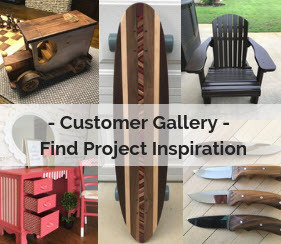 Collect your answers to the questions at the beginning of this article and go to Rockler.com, where you can search our selection of blades by brand, blade type, blade diameter, material to be cut and price. If you are planning to cut a variety of materials and prefer not spend time frequently changing from one specialty blade to another, a general-purpose blade is a good choice. Freud's new Premier Fusion blade combines an aggressive hook angle and large gullets with the clean cutting action of a Hi-ATB tooth grind for a blade with the widest range of excellent cutting capability.